It's simple really; Chem-E Car are a group of university students who wanted to participate in a design team. The chemical engineering background shared by much of our team led us to look past conventional engineering competitions. Thus, we decided to participate in the AIChE Chem-E Car competition for the first time in March 2014. 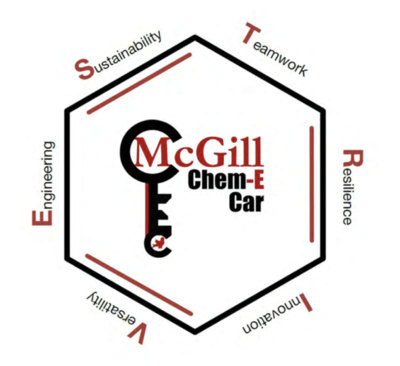 The idea of having a McGill Chem-E Car Team started in the summer of 2013 when David Villegas brought a group of his fellow McGill chemical engineering students together with the goal of participating in the AIChE Chem-E Car competition. Those involved started researching reactions for power source and stopping mechanism, playing with microcontrollers, and designing the body of the car. As the year progressed, the Chem-E Car design idea was made into a reality thanks to the support of various organisations and sponsors. 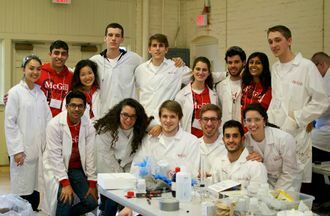 After overcoming many unexpected problems, and many hours of calibrating the reaction, the McGill Chem-E Car Team made its way to their very first appearance at the AIChE Chem-E Car - North East Regional Competition. The competition was hosted by the University of Connecticut at the end of March 2014. The team placed 6th out of 14, an excellent first showing! Our vision is to build a team structure that will increase involvement of students in chemical engineering, other engineering programs, and other faculties in large team based design projects. The Chem-E Car team is split into five sub-teams: Power Source, Stopping Mechanism, Electrical, Mechanical and Management. Each sub-team operates as an interdependent entity, with project requirements set at the beginning of the design cycle. The power source team researches, tests and designs an energy source to power the car. The power source must be reproducible on competition day. In addition, it should adhere to the competition's safety regulations. The stopping mechanism team designs a procedure by which the car stops as required by the competition rules. The team must design a precise and accurate mechanisms and a calibration curve that will calculate the concentrations or quantity of reagents that will result in the completion of the reaction at the required time. The electrical team programs the car to run the motor and respond to the stopping mechanism. The mechanical team is reponsible for designing the car's chassis and mechanical components. The car is custom built and is made of some 3D-printed components. The management team is responsible for the operation and logistics of team operation. This includes organizing events, managing the team's social media, contacting sponsors, and planning outreach efforts. The Chem-E Car competition is an undergraduate design competition hosted by the American Institute of Chemical Engineers (AIChE) in which teams of engineers from universities from across North America design and build small cars powered and stopped exclusively by chemical reactions. According to the competition rules, the car has to be able fit in a 40 cm x 30 cm x 20 cm box and can’t exceed $2000 worth of material. The competition is primarily a performance competition in which the car must carry a specific weight a precise distance usually between 15 and 30 meters. Awards are given to the 1st, 2nd and 3rd place winners whose cars arrive most closely to the desired distance. In addition, the competition places a great emphasis on economical, sustainable, safe designs that apply sound and advanced engineering concepts; awards are thus also given for original car and drive systems designs as well as for performance in a poster presentation. McGill’s Chem-E Car team placed first in Nationals 2015 and qualified to attend the 2018 Nationals Competition in Pittsburgh after a second place prize in Regionals 2018 in Rochester! McGill’s Chem-E car team competed in 2019 in the Northeastern Regionals Competition at University of Massachusetts against teams from Cornell, Rensselaer and several State schools. The team successfully placed first in the competition and qualified to the AIChE national championships. The Chem-E Car team holds information and recruiting sessions every Fall semester. There one can learn more about what the team is currently working on and how one can get involved. The Chem-E Car team could be contacted on their E-mail, website or Facebook for questions or more information. This page was last edited on 11 April 2019, at 10:33.